Getting to rehab in the first place is perhaps the biggest hurdle in battling addiction, but it’s certainly not the only difficult part of the process. Transitioning back into a sober life has plenty of its own challenges, but as those who have gone through it can attest, it can be done. In this guest post from Cecelia Johnson of Recognition Works, she spoke with a number of them personally, and in this article, you’ll hear some of their stories. Their goal is to inspire people with their words of wisdom, and show that no matter what hardships we face, there is light beyond the darkness! For some, it isn’t so much the idea of going to addiction treatment that brings anxiety — it’s the idea of leaving. Suddenly, you’ll be out on your own in the real world with no one guiding you through sober living. It’s true that a good rehab center will teach you to be accountable and avoid temptation, but nevertheless, it’s intimidating to walk out of treatment and feel that sense of being on your own. Fortunately, there are ways to stay on-track. Here’s what a few recent addiction treatment graduates had to say about leaving rehab, and continuing to fight the good fight for sobriety. After years of substance abuse, some recovering addicts worry they won’t remember how to have fun without drugs or alcohol. But Ryan told me that a recent rave show helped him recognize the difference in having a good time sober versus under the influence. “In the past, going to a show like that would be impossible unless I was drinking or using something. I never thought that I could enjoy certain things not messed up,” he admitted. This time, however, he went with a large group of sober friends and had a blast — all without a single substance. Keeping such a big part of your life secret can be overwhelming, especially on top of all the other challenges recovery throws at you. John said that after his time at the Treehouse in Texas, he and his wife let the truth set them free. “We got tired of trying to put on a front and look like we had it all together. So we said, ‘Screw it! Let’s just talk openly and honestly about how difficult it is,’” he explained. The couple runs their own blog about life in recovery, and use it not only as an open outlet for John to heal, but as a way to help others do the same. “We want people to know it’s OK to not be OK after treatment. It can still be a grind. There’s that impression that you’re cured when you get out of treatment, but the real work begins when you leave,” he said. Sally agreed that honesty and reaching out to others is healing for all parties. “I’m able to share my story and help others, and that’s a big part of it — you have to be proud of the work you’ve done. Sharing that helps other people,” she said. At the end of the day, sometimes the most effective route is to simply remember your journey. There’s a lot at stake in recovery, a lot to lose if things go wrong. For Wendy, it’s thinking about all that she’s worked so hard to attain — and how easily it could all slip away. “My advice to someone once they get sober is never to get too complacent — no matter how much time you’ve had, you’re always one drink, one toe, one line away from relapse,” she said. A recent study revealed that the U.S. has seen an alarming rise in suicides. In fact, with the rate now at 13 suicides per 1 00,000 people, it’s at an all-time high since the mid-1980s. Ms. Johnson and RecognitionWorks work to connect those who’ve been recognized for outstanding work with organizations that can help them through donations, sponsorship, and gifts. Their goal is to inspire people, and show that no matter what hardships we face, there is light beyond the darkness. Rachel Thompson released the BadRedhead Media 30-Day Book Marketing Challenge in December 2016 to rave reviews. 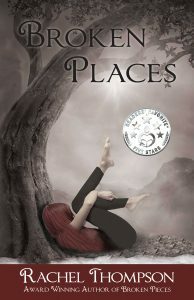 She is the author of the award-winning, best-selling Broken Places (one of IndieReader’s “Best of 2015” top books and 2015 Honorable Mention Winner in both the Los Angeles and the San Francisco Book Festivals), and the bestselling, multi award-winning Broken Pieces (as well as two additional humor books. Rachel’s work is also featured in several anthologies (see Books for details). She owns BadRedhead Media, creating effective social media and book marketing campaigns for authors. Her articles appear regularly in The Huffington Post, Feminine Collective, Indie Reader, Medium, OnMogul, Transformation Is Real, Blue Ink Review, Book Machine, and several others. Not just an advocate for sexual abuse survivors, Rachel is the creator and founder of the hashtag phenomenon #MondayBlogs and the live weekly Twitter chats, #SexAbuseChat, co-hosted with certified therapist/survivor, Bobbi Parish (Tuesdays, 6pm PST/9pm EST), and #BookMarketingChat, co-hosted with author assistant Emilie Rabitoy (Wednesdays, 6pm PST/9pm EST). She hates walks in the rain, running out of coffee, and coconut. A single mom, she lives in California with her two kids and two cats, where she daydreams of Thor and vaguely remembers what sleep is. For contact information, visit rachelintheoc.com or BadRedhead Media at badredheadmedia.com.